Exclusive mode is the device, not parameters. The parameters are set by Windows. As I said, you need to choose that device/card, and bitstream to it. But it needs to be able to decode the audio, and I don't think it has the ability to do that. At least not all of them. Just because it's an internal card/device, doesn't change how the mechanics, work. Bitstreaming isn't exclusive to HDMI. You need to digitally send the audio to the card, and let the card decode it to analog. Both MPC-BE and Foobar2000 support WASAPI exclusive mode with my soundcard, playing FLAC and DTSHD. Yes, the software is decoding but the decoded bits are still "streamed" to the soundcard. I know the soundcard doesn't decode DTSHD, it doesn't need to. Edited by lifespeed, 02 February 2019 - 04:22 AM. Do you have the audio exclusive option enabled? Yes, it is shown in the MPC-BE screenshot. Foobar2000 lets me do the same thing. Or maybe you mean windows sound configuration? The answer is still yes. I would like to know if MPV supports configuration for exclusive mode. In the log file it clearly states it is using shared mode. I know exclusive mode works because when I play audio in a web page while another application has the soundcard in exclusive mode the web page audio (or windows sounds for that matter) are not heard. Edited by lifespeed, 02 February 2019 - 04:37 AM. Darn, I thought that was it (I did not have it checked). Unfortunately it doesn't work, still in shared mode as you can see below, changes to the windows 48KHz setting instead of the original media 96KHz, and allows web browser sounds to play simultaneously. That checkbox doesn't appear to do anything. [   0.838][v][ao/wasapi] No device specified. Selecting default. [   0.914][v][ao/wasapi] IAudioClock::GetFrequency gave a frequency of 1152000. [   0.916][v][ao/wasapi] device buffer: 2400 samples. [   0.916][v][ao/wasapi] using soft-buffer of 9600 samples. And also enable exclusive mode. That will prevent other apps from using the audio device while you're watching something. You can't use the ID because that will change over time, but the name, won't. If you were to reinstall that audio device, the ID will be different, so you can't use that. If this doesn't work, then something else is not letting it happen. You're using Windows 7, correct? Edited by Doofus, 02 February 2019 - 05:40 PM. in MPV.CONF it started working in exclusive mode. 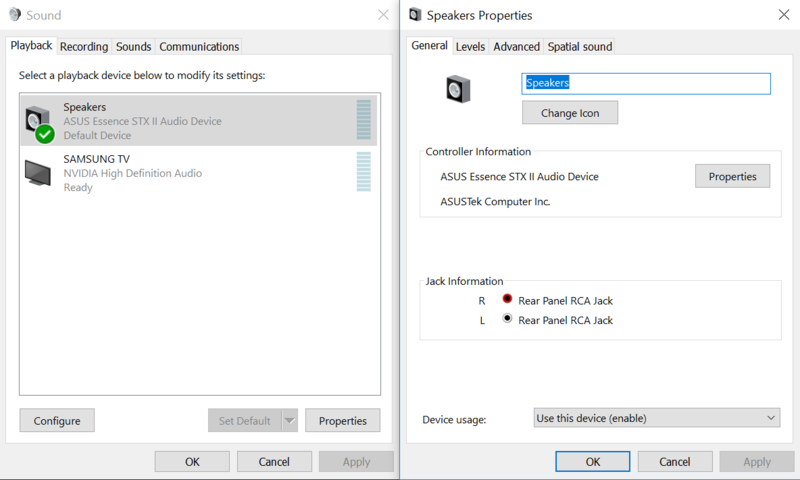 I don't need to specify the audio device, it uses the soundcard default, although specifying the soundcard by name instead of ID as you suggest did work also. If you look at the log below it tries many different channel configurations and bit rates/depths. Ultimately it does arrive at the appropriate 96/24 5.1, and it is in exclusive mode. It sounds like with a receiver you don't need to put exclusive mode in your MPV.CONF file? Perhaps the developers are testing with receivers, not sound cards, for exclusive mode? Maybe didn't look at the soundcard use case. Below is the (somewhat longer) log file showing the negotiation of channel configurations and bit rates/depths, ultimately arriving at the correct result. [   0.566][v][ao/wasapi] No device specified. Selecting default. Edited by lifespeed, 02 February 2019 - 06:29 PM. Well, with an internal card, Windows is essentially the device, as you aren't bitstreaming. So mpv needs to probe the capabilities. 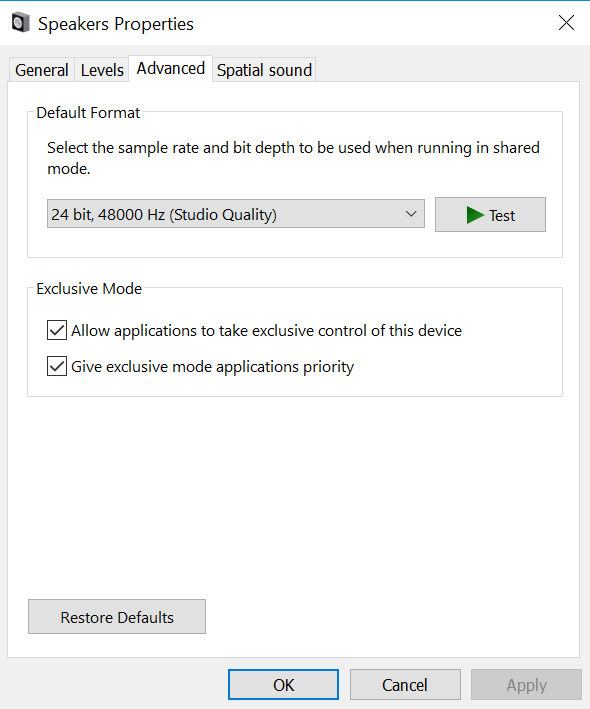 I trust that you've configured Windows audio and the device settings? Because it is a sound card I don't have the "supported formats" tab delineated like you do in your receiver, but everything else is set up. 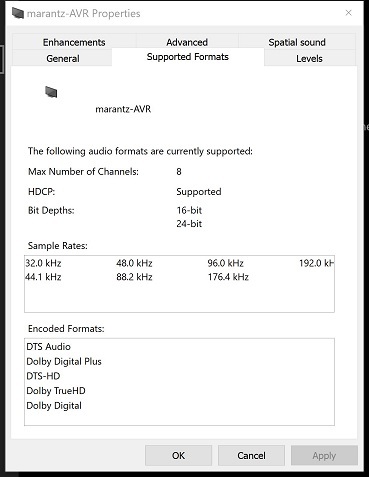 I set Windows to the most-common 48/24 sound format, using WASAPI exclusive to force 44.1/16 CD audio and 96/24 hi-def to play without requiring either re-sampling or manual bitrate reconfiguration through the windows sound panel. 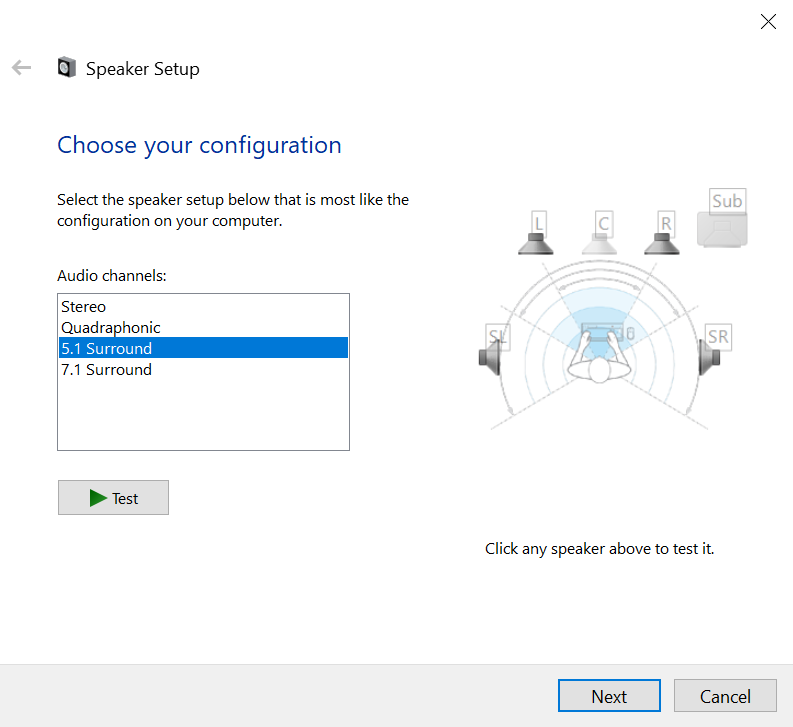 I have a 4.0 physical speaker configuration, which Windows implements as 5.1 without center channel or subwoofer. You can see those speakers are greyed-out in the sound panel config. It does all seem to be working with Emby now, thanks to the forced exclusive mode in MPV.CONF. I still think this is an Emby bug. You don't have to force exclusive mode to have it work? Looking at the MPV log files it appeared to be ordinary 5.1 sound. I suspect the difference is sound card with software decoding of the audio vs. bitstreaming over HDMI. In which case I would like to ask @Luke to try to reproduce MPVs failure to follow Emby's exclusive mode check box. I doubt it is anything unique to my setup other than using a soundcard vs. a receiver. Emby was the last of my important media player apps that wasn't using WASAPI exclusive which implies the bitrate appropriate for the media, so I'm glad to see it working now even if it is a MPV.CONF entry. As we've seen there is still work to do matching MPV's configuration of nVidia deinterlacing, HDR, and now WASAPI exclusive mode with Emby's user-selected configuration. Thanks again for your help. Someday soon I hope to look at the videophile aspects with a 4K HDR screen. For now the sound is a big deal to me. I just tested disabling bitstreaming and left exclusive mode, enabled. It gets disabled, too. [   0.749][v][ao/wasapi] Disabling multichannel output. So I think the speaker layout option is getting in the way. Edited by Doofus, 02 February 2019 - 08:17 PM. I honestly don't see the need for the speaker layout option. 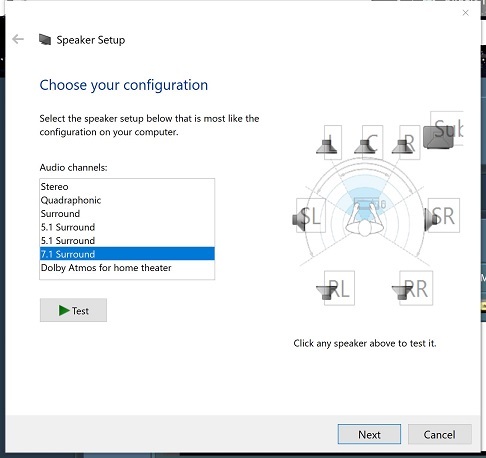 As long as windows audio is configured, that's really all you need. It's just one more thing to get in the way and confuse people. In that last test I did, it actually messed up what was supposed to happen, and I got an incorrect output. I say just remove it. Or use it only for music, as it's tied to using the upmix option. Edited by Doofus, 02 February 2019 - 08:32 PM. 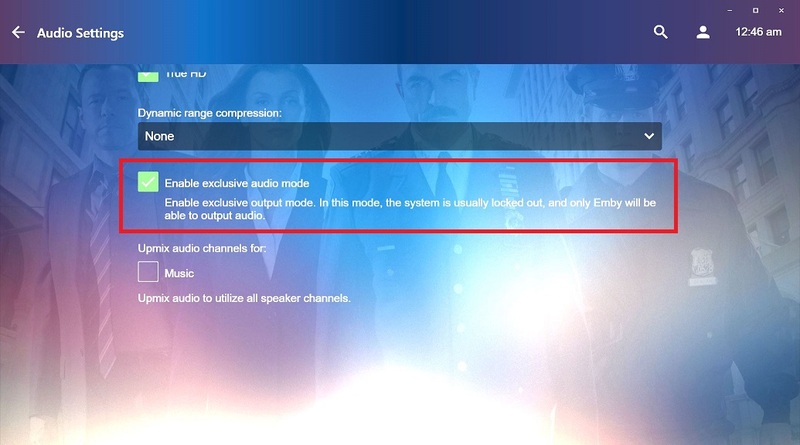 You're referring to the speaker layout in Emby causing exclusive mode to fail? 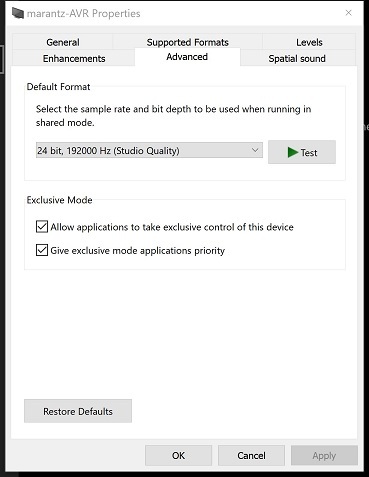 I also saw that exclusive mode only worked when I set Emby to 5.1 audio, which is what Windows is configured as. However, in my case with a soundcard, I still have to force exclusive mode in the MPV.CONF file. Only with audio passthrough, disabled. When enabled, exclusivity, fails. And I think it's failing in that circumstance because the audio layout has to match everything else. Take a look at this. I think there's a point in the way this is implemented that it hits a wall, and fails. Like the layout is taking precedence, and dis-allowing exclusivity. And that's why you can use it in the mpv.conf, because Theater can't affect it. It's only the option in Theater that gets defeated. It's like the audio passthrough option is directly tied to exclusivity. Disable one, and you disable the other. Now that I'm writing this out, that actually makes more sense than the audio layout. Exclusivity should be a global function, and not be linked to anything. A simple on/off. It shouldn't be for a specific media type. Luke, could that be changed to only use? But I guess we'd need a no option. How would I write that? Edited by Doofus, 02 February 2019 - 10:34 PM.